With the Panasonic Toughbook FZ-L1 stylish design meets robust reliability. It is the ideal all-rounder for everyone in retail, hospitality, production, transportation and logistics. 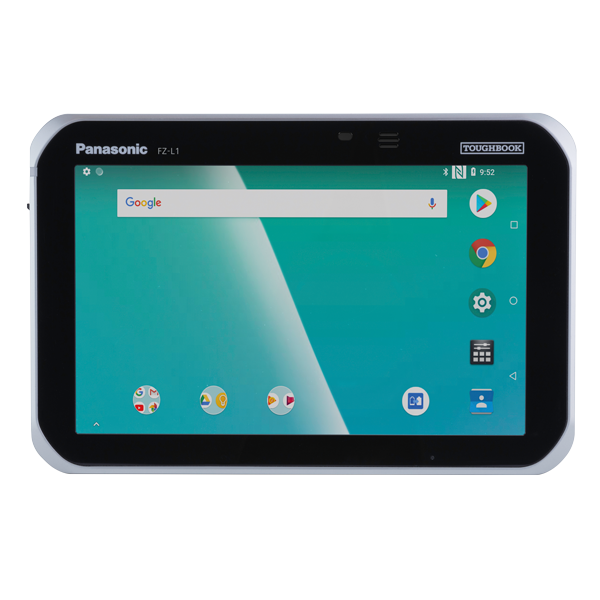 The FZ-L1 tablet is equipped with Android 8.1 and is very robust: it is IP67-certified and tested to meet MIL-STD-810G standards. The Toughbook's anti-glare 7’’ HD display is easy to read in daylight and convinces with a resolution of 1,280 x 720 pixels. It features a glove and rain mode, so it may be used in almost all outdoor conditions. On the rear is an 8 megapixel camera. Optionally, the Toughbook is available with an integrated 1D/2D barcode scanner. Panasonic equipped the Toughbook with a powerful 3200 mAh battery — so it works a complete shift. The battery may be changed during operation (warm swap). In the charging station it is fully charged in 2.5 hours. Order the Panasonic Toughbook FZ-L1 with your sales representative. Call us today!